Following the two domestic trailers that debuted late last year, Lionsgate, courtesy of Jo Blo Movie Trailers, has unleashed an international trailer for Gods of Egypt, which includes more action-packed footage. 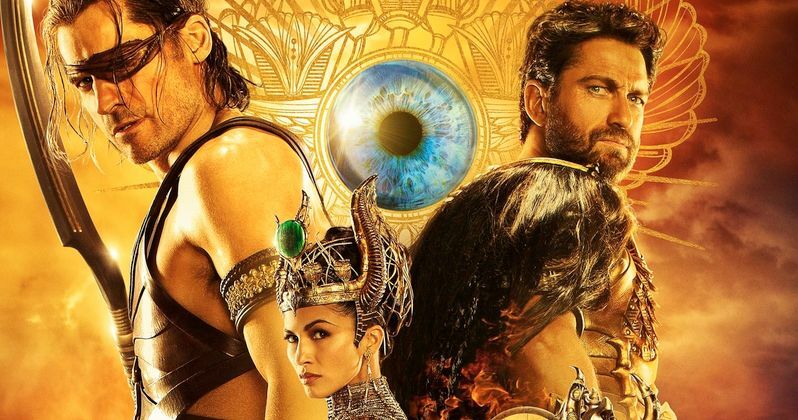 This new adventure features an all star cast including Gerard Butler stars as Set, God of the Desert, He is joined by Nikolaj Coster-Waldau as Horus, God of the Sky, Brenton Thwaites as Bek, Thief of Legend, Chadwick Boseman as Toth, God of Wisdom and Elodie Yung as Hathor, Goddess of Love. We'll have to wait and see if fans respond to this adventure when it hits theaters in just a few short weeks. As their breathtaking battle against Set and his henchmen take them into the afterlife and across the heavens, both god and mortal must pass tests of courage and sacrifice if they hope to prevail in the spectacular final confrontation. The supporting cast includes Geoffrey Rush as Ra, Rufus Sewell as Urshu, Courtney Eaton as Zaya, Abbey Lee as Anat and Goran D. Kleut as Anubis. Alex Proyas (I, Robot) directs from a script by Burk Sharpless and Matt Sazama (The Last Witch Hunter, Dracula Untold). Gods of Egypt has been given a February 26 release date, going up against 20th Century Fox's Eddie the Eagle and Open Road Films' Triple 9. Another epic adventure, MGM's Ben-Hur, was originally set to arrive on this date, but it was recently moved to August 12, 2016. While Eddie the Eagle has been getting a lot of critical buzz over the past few weeks, Gods of Egypt still may overtake it to become one of this year's early box office hits. Gods of Egypt brings Gerard Butler back to the "sword and sandals" realm, 9 years after he became a household name by portraying King Leonidas in the epic blockbuster 300. Do you think Gods of Egypt can be just as successful as 300? Or do you think it could be one of this year's early flops? Let us know what you think, after taking a look at the latest footage.